Sat, Sep 8, 2018, 09:54 am SL Time, ColomboPage News Desk, Sri Lanka. 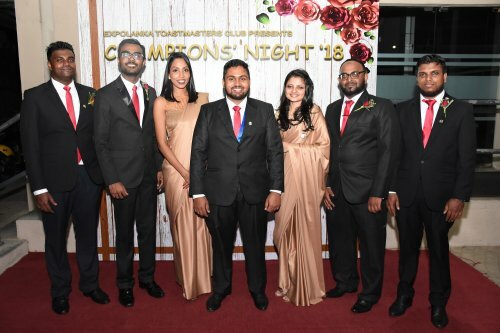 Sept 08, Colombo: The Toastmasters Club of Expolanka (Pvt) Ltd recently held its seventh installation ceremony for club officers at the EFL Campus Auditorium in Wellampitiya. The ceremony was themed 'Champions Night' in recognition of a strong winning streak by members at both local and international level. The Expolanka Toastmasters Club has received President's Distinguished awards by Toastmasters International for the past six years consecutively. Other awards have included coveted titles such as Golden Gavel, Club Quality, Producing Chief Judges, TLI Chairs, Super Star Area Directors, Distinguished Toastmasters, Social Media Awards and Champion Speakers. The event celebrated these accomplishments in the presence of Expolanka Group management, prominent Toastmasters, past and present members of the club, distinguished guests and family members of the Executive Committee. The installation also inducted the officers for the year 2018/19. Director Division F DTM Zaidh Naushard inducted the following officers; Toastmaster Ahmed Mauroof (President), Toastmaster Safiya Ismail (Vice President Education), Toastmaster Gazzaly Moulana (Vice President Membership), Toastmaster Sameera Dilhan (Vice President Public Relations), Toastmaster Sharon Rodrigo (Secretary), Toastmaster Mohamed Mirzan (Treasurer), and Toastmaster Allan Paul (Sargent at Arms). The immediate past President for 2017/18 is Toastmaster Hisham Yasir. Toastmaster Sharon Rodrigo (outgoing VP Education) received the evening's highest honor- the Best Toastmaster of the Year 2017/18. Rodrigo was instrumental in the club achieving 10/10 DCP points, the Golden Gavel Award and Club Quality Award for excellence in education. Speaking at the event, Hanif Yusoof - Group CEO commended the Expolanka Toastmasters Club for its drive and enthusiasm for competitive speaking. The Club has played a key role in improving the members' communication and leadership skills, which they have applied in both professional and personal capacities.